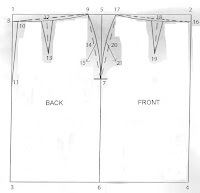 See the written instructions and diagram on how to draw a basic skirt pattern. From this one pattern you can make the modifications to make practically any other type of skirt and adjusted to perfectly fit your own unique bumps and curves. See my Skirt Pattern Tutorial Video on Fettuccinetube . Thanks for a great tutorial! I make all my own patterns already but found your instructions really easy to understand and straight forward. I shall be directing my friends to it. Hi. I'm from France and I just discovered your blog and YouTube tutorials. I love how you do all this. Thank you so much. Bon jour! Merci beacoup! France is the fashion capital of the world! I am honored that you have visited my blog. Excuse my spelling. I later learned that "Petit Poix" is not correct. I hope to post more videos on youtube soon. I have had a busy few months and have not been able to make videos. Thank you for your encouragement! This is great! I'll definitely have to come back and try this!